This speaking series has been designed and created by author, Prince Daniels, Jr. and aims to encourage students to develop, learn, and practice mindful habits, inner peace, and self-confidence while promoting literacy. The I’mAgine Speaking Series has been designed to connect with youth of all ages. Designed to educate participants about practicing mindfulness and the effects of a mindful lifestyle. This invigorating speech provides educational information, a guided mindfullness and focusing exercise. It is a great tool for introducing mindfulness to beginners. Designed to showcase the significance of physical fitness and the positive effects it can have on your overall wellbeing. It consists of an inspirational and informative speech related to wellness and mindfulness and offers a fitness-related activity, such as yoga, or other activities that all participants can engage in regardless of fitness level. Developed to help students to realize and embrace their inner genie as a means for motivating them to focus on making their dreams come true. In this presentation, Prince gives a personal narrative of his life – from humble beginnings to playing football, collegiately and professionally, to the present. He explains his mindful habits and how it has impacted his life while relating to his audience. Take the mindfulness lessons found in the I’mAGine novel series and infuse them directly into the classroom experience with the I’mAGine Mindfulness Curriculum. This learning tool comes equipped with a supplemental reading comprehension workbook with over six hours of multimedia content and resources to help students better understand mindful concepts, principles and practices. 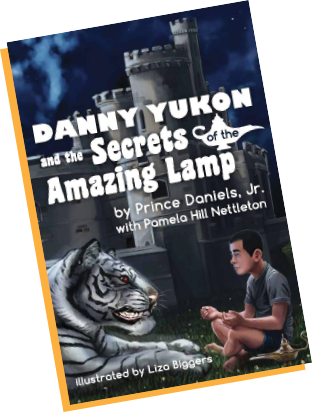 Danny Yukon and the Secrets of the Amazing Lamp is the first book in the I’mAGine Series, a collection created by former NFL player and international mindfulness and fitness expert Prince Daniels, Jr., and written by award-winning author and playwright Pamela Hill Nettleton. I’mAGine is meant to be pronounced “I’m a genie.” The series seeks to teach children the benefits and practices of mindfulness. It speaks to the powers of peace and healing that live within us all. 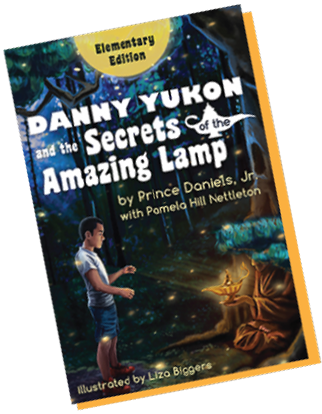 Danny Yukon and the Secrets of the Amazing Lamp is the story of a young boy who overcomes the loss of his father —a U.S. soldier serving in Afghanistan. As a result of the tragedy, Danny becomes mute. At night his dreams are haunted by a ferocious tiger. It is not until his uncle gives Danny an amazing lamp—and teaches him how to meditate— that he learns the key to his powers lie within. This edition is adapted from the Youth Edition, with simple sentences, large type, and colorful pages. We would love to answer all of your questions. For general inquiries, please feel free to fill out the contact form with the necessary information. We will be sure to get back to you. See press coverage of The Amazing Lamp for more information.